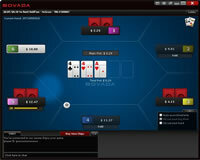 Bovada Poker is the new face of Bodog's popular poker room, but designed specifically for US players. After the online poker world withstood a tumultuous year in 2011 (with events such as the infamous Black Friday), Bodog's operator decided to play it safe and pull Bodog out of the US market. In its place, they created Bovada Poker. This poker room uses the same revolutionary software that made Bodog Poker famous and it still has the same trusted operator - the Morris Mohawk Gaming Group (MMGG) - based and licensed in the Mohawk Territory of Kahnawake, Canada. This is the ideal poker site for US players, but non-US players may still just go straight to the normal Bodog website. All US players that had Bodog accounts now automatically have accounts with Bovada Poker and this fact alone gave the site's traffic figures a huge boost that most new poker sites could only dream of. It may take some time for Bovada Poker to become a true powerhouse in the online poker world, but after the legal fallout that took place in 2011, Bovada Poker is poised to fill the void that was left for American online poker players. Even after a relatively short operating period, Bovada Poker already has approximately 2,500 players cruising the tables at peak times, thanks to being on the same network as Bodog! Bodog Poker has long been known for attracting fishy players and offering soft competition. This is particularly true when it comes to the lower limit Hold'em games. Since player accounts are being migrated automatically, and since this site shares its traffic with Bodog, it's reasonable to assume that this trend will continue with Bovada Poker. Also, the spillover of novice players from the Bovada sportsbook and casino will surely have a positive effect in terms of keeping the competition light. Bovada Poker has not made any secret of the fact that they cater to recreational players, so pros and semi-pros tend to stay away from the Bovada and Bodog tables. The free software at Bovada Poker is exactly what you have grown to expect from Bodog. The lightning fast Bovada Poker download and software package works on both PC and Mac operating systems, and the change in brand name has not affected the special features one bit. Although the software is a little short on some of the more exotic software features, options like resizable screens, four-color decks, a record of your player stats, and multi-tabling are all available at Bovada Poker! The welcome bonus for new players at Bovada Poker is an impressive 100% match bonus worth up to $1,000. You have up to sixty days to clear this bonus and it is only available to new players who have made a real money deposit. You can clear this bonus by earning player points - $0.20 will be cleared for every point earned. The best part is that you don't even have to play to earn points! You will receive one point per hour, just for sitting at a real money table, and you can win as much as 500 points per month (enough to clear $100.00 of your bonus) using this method alone. Of course, as with most online poker rooms, buy ins and rake contributions are the primary ways to earn player points. Every time you get 50 Poker points, you can expect to see $10.00 sitting in your account, totally cleared, the following day. The support staff at Bovada Poker can be reached 24/7 via both phone and email. Under the Bodog brand name, this company's customer service was unmatched (over 99% of calls being answered without being put on hold) and there is no reason to think that this stellar service will change anytime soon. This is hugely important because, whenever you have a problem, these are the people that you will be counting on. For less pressing matters, you may decide to simply refer to the site's extensive FAQ.